The Pie Pan of choice used for constructing with both light weight or heavy weight pots. One Non-Stick Pie Pan 8.75 by 1.25 Style #92684 Lifetime Hoan Corporation Westbury, NY. The pan actually measures on the top outside diameter of 9.75 by 11.25 and the bottom is 7.25. Its weight is 9 oz. I chouse steel so that one can sand off the non-stick layer and then solder to it. Cost was $1.99 from Big Lots a local store. In one rendition the lips around the edges were bent up to hold the top pot into the same position each time it was set on it. 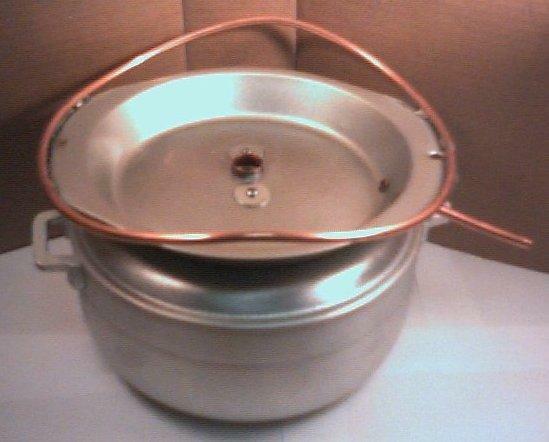 Another way was to solder a .25 copper tubing, making a circle, to the pie pan. This keeps the top pot from sliding off. See photo at top. Turn this pan upside down and take a hammer and gently pound the bottom into a dome to match the curvature of the lid on the bottom pot. 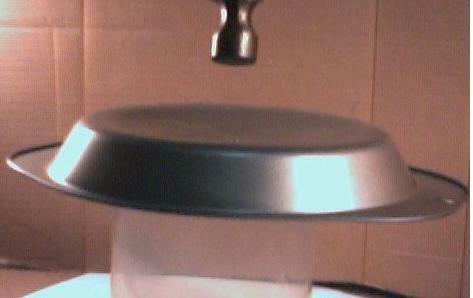 I used an old lid from a CD-ROM 100 dispenser to support it while gently pounding on the pie pan with a hammer. See photo below. Move the CD dispenser or large pipe support around to near the side as you work your way around from center to edge, then from center to edge. Small dents from each hammer stroke gradually make a budge that will eventually fit the curvature of the lid for the bottom pot. The center section when fully constructed will weight between 12 oz and 1 lb 13 oz depending on the lid used for the lower pot. See photo at bottom.